Discussion in 'Article Discussion' started by Dogbert666, 3 Oct 2014. I managed to snag one when Amazon dropped the price to £40 briefly and I was so impressed with it I bought one full price for the other half. £40?? Jesus, that's an incredible deal. Quick question: going on the review would i be right in assuming the replacement earcups just use normal foam and not memory foam. That's a really attractive looking headset. White and black is a great combo for peripherals IMO as it's both visually exciting but not garish like green/blue/red accents. I have one complaint though, why does everything have to be braided cable? And if it is to be braided, why not use a more durable material? The standard braid that comes on these things frays like anything, my mouse looks as if it's attached to a feather duster now. A solid PET sleeve would be welcome in this respect as it wouldn't fray. Or better still, the cables should be easily detachable and replaceable like with decent keyboards. Don't need a new headset any time soon, but I'll pass this on as a product to watch to any friends who might. I was surprised Amazon honoured the price to be honest. One thing I will mention is that these should really be paired with a discreet audio card. I recently had to drop down to onboard sound from my X-Fi due to the addition of a second graphics card and the sound quality really did take a nosedive. I've managed to claw a bit of quality back with an Enermax Dreambass while I'm waiting to pickup a Xonar D2X from a friend. I was surprised Amazon honoured the price to be honest. 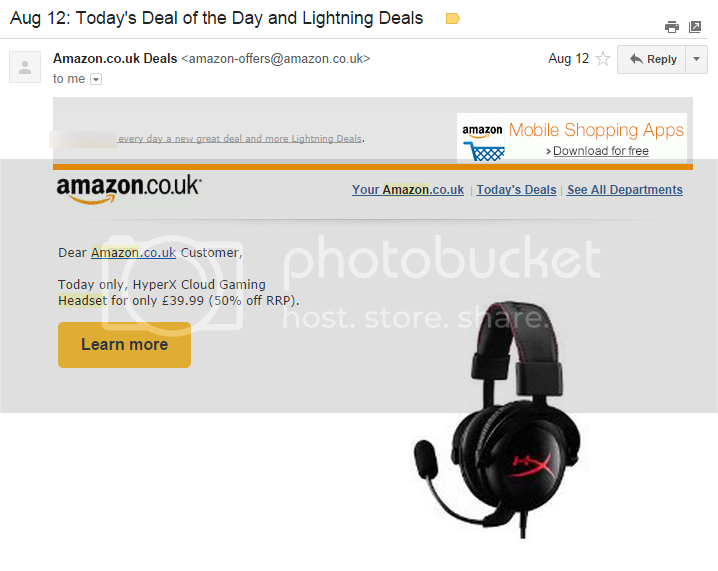 It was an Amazon daily deal thing - to the extent that it was advertised by Amazon themselves in their newsletter email! Got a pair of these when Overclockers had them on special offer at £53. Very pleased with them, comes in really nice premium packaging with a few nice extras..and they were in black & red trim that matched the rest of my build. some months ago I bought myself ATH-M50... was blown with the details in the sound (before was using Roccat Kave). do I have to be sorry? Am I not the only person here irked beyond words by the inclusion of the word "cloud" in ... A. Gaming. Headset!? It doesn't bother me to be honest especially as there doesn't seem to be any hint of the word on the actual product, I also have to ask if the reason for you being irked is to do with your use of the word 'cloud' in the first place? I'm wondering if the word Cloud is related to the fact they sponser Cloud 9 ("HyperX"), one of the best League of Legends teams atm or if they just tacked it on to sound cool. Either way, I also picked it up when it was on Amazon's £40 special offer... I couldn't resist the temptation at that price even though I'd recently gotten a pair of Corsair Vengeance 1400s after RMA'ing my broken HS1A which finally died just within the 2 year warranty (<3 Corsair). I have to say, my initial impression was that the headset was a little smaller than I was hoping for... moving from a Steelseries Siberia v2 -> Corsair HS1A -> Vengeance 1400, I'm used to having much larger cushions for my ears, whereas the HyperX Cloud only just seems large enough to cover them. The main issue I have with this is that the earpads end up exerting a small amount of pressure on the end of my glasses frame. It's comfortable enough for a moderate periods of time, but you do start to notice it after extended periods of gaming. I do have to say though... sound quality is definitely better than the Siberia, HS1A and 1400 . I still think of FFVII when anything has Cloud in the name, so it's a positive association for me! I bagged a set of these as well when they were 40 quid, my daughter had already bought the white and black version and I was so impressed with them. I would have preferred the black and white ones also but I wasn't going to be picky at that price. I also have to ask if the reason for you being irked is to do with your use of the word 'cloud' in the first place? I'm a sysadmin by trade, and "cloud" is essentially a buzzword in the IT community that's been overused and overhyped, to the point where WD have slapped the "cloud" name on a hard drive, just because it shares your data out of your home Internet connection and calls it a "Personal Cloud". As a result, the term has essentially been devalued - much like DevOps - to become a wooly term that nobody really understands properly. I wrote a blog post on the misconceptions around cloud computing - a company just whacking the name "cloud" onto a gaming headset that doesn't even have any internet connectivity is just ridiculous. I seem to remember when Mr Halfacree first posted a news article that Kingston were going to release the HyperX Cloud that the 'Cloud' moniker referred to the memory foam earcups, as in they feel as soft as a cloud. Yeah, got the £40 Amazon deal too! Bought them for a mates birthday, he LOVES them! Agree with you guys about the bass btw! I used to sneer at "gaming" headsets, and to be quite frank part of me still does. They seemed to focus more on branding and garish colours/designs than good audio performance. These at least seem to have nailed the audio quality, even if the styling is still a little garish for my liking. Something that does still irk me however is that few reviews seem to focus on the quality of the microphones on these headsets. It's all well and good having great headphones, but if they use cheap electrets mics that make you sound like you're speaking from the inside of a baked bean can filled with treacle then why bother including it in the first place? You don't need a studio microphone for voice chat I'll admit, but voice chat applications have come a long way and poor microphones will make it difficult to be heard clearly. It's for exactly this reason that I steered well clear of "gaming" headsets when I wanted to replace my studio condenser mic with a headset. Some of them might have comparable audio quality to the microphone I was using, but very few reviews actually discussed the microphone. Instead I went for a broadcast headset and picked up an Audio Technica BPHS1 headset. I am exceptionally pleased with it; granted it's double the cost of this headset but the quality of the audio from the microphone is superb, and the headphones themselves are far far better than anything else I've ever used. They've even supplanted my Grado SR-80i headphones as my first choice for listening to music - listening to Devin Townsend Project on these things is like a whole new experience. They're worth every single penny of the £130 I spent on them IMO; of course you need a 6.35mm jack for the headphones, not 3.5mm, and the microphone needs an XLR connector - preferably a device with a good preamp - so they're not gonna suit everyone! I've wandered off topic a little so to get back to my point: in the future can you please go into a little more detail about headset microphones? A clip of someone saying "Check one two" and a short sentence recorded with the microphone would suffice ("check one two" covers pretty much the entire frequency range that you'd be interested in). Just "records sound well" doesn't really tell me anything!